All-new commercial van models have entered or will soon be entering the North American market. These vans are causing fleet managers to take a fresh approach to different application possibilities including: plumbers, handymen, construction contractors, mobile mechanics, and mobile tire service technicians. These European-style vans are fuel efficient and have a tremendous amount of cargo space – over 75 percent more than the largest E-series. Available with a 3.7L V6 gas (275 hp/260 lb-ft), or, 3.5L EcoBoost V6 gas (310 hp/400 lb-ft), or, 3.2L I5 diesel (185 hp/350 lb-ft), the Ford Transit has the most available power/torque with the 3.5L EcoBoost V6. The Transit is also available in three body lengths, two wheel bases, and three roof heights. The Transit has a rear-wheel-drive layout, but its engine layout is perhaps a little more innovative than the competition— mostly due to the EcoBoost engines. Available with a 2.0L gas, or, a 2.5L gas, or, a 1.5L EcoBlue diesel engine, the Ford Transit Connect is a smaller option for those doing lots of city driving and not requiring a tremendous amount of space or power. It is the minivan option of the commercial van market. Available in a 2.0L I4 turbo diesel (161 hp/265 lb-ft), or, a 3.0L V6 turbo diesel (188 hp/325 lb-ft); the Mercedes-Benz Sprinter has the highest available roof at 115 inches (almost 10 feet). It also has the longest available body at 290 inches, compared to the Transit at 264 inches, ProMaster at 248 inches, and Savana at 244 inches. The Sprinter retains a higher-quality interior than most of these vans, with very refined powertrains as well, although they come at a premium price point. The Mercedes-Benz Sprinter is also available in a four-wheel drive option. For good ground clearance, a 4×4 Sprinter sits about 4 inches higher than a 4×2 model. This full-size van is available with a 3.6L V6 gas (280 hp/258 lb-ft), or, 3.0L I4 turbo diesel (174 hp/295 lb-ft) and is primarily configured for commercial duty. RAM believes that by placing the bulk of the ProMaster’s mechanical components ahead of the cargo area it makes up-fitting for commercial needs easier in most cases. Available in two different roof heights, 91 inches and 101 inches, the ProMaster can handle a gross combined weight rating (GCWR) of 11,500 pounds. Available with a Vortec 4.3L or 6.0L V6 gasoline engine, a Vortec 6.0L V8 compressed natural gas engine, and a Duramax 2.8L turbo diesel engine, the Savana provides loads of power and can tow up to 10,000lbs in tow/haul mode which reduces excessive gear-shifting. It is equipped with pro access lift panels, heated mirrors and Stabilitrack with traction control. When switching to these Euro-style vans, the goal isn’t just controlling costs, fleets are also looking to increase productivity. Fleet managers want to add customers by increasing the number of jobs done per day, but keep lower operating costs available on commercial vans. For businesses, the trend has been shifting away from focusing on up-front acquisition costs to lowering the total cost of ownership over the life cycle of a vehicle. Fleet managers are no longer basing their purchasing decisions on the acquisition cost. In today’s economy, every dollar counts. Many fleets are now realizing the value in investing the time and energy in researching the best option for their business. They’re taking a closer look at the real cost of ownership and all the vehicle purchase entails – not just the purchase of the vehicle itself, but all of the lifecycle costs associated with the vehicle. See how commercial van market growth has created new opportunities for specialized equipment. When making purchasing decisions, we’re seeing that commercial van customers are considering TCO over the lifetime of their vehicle. They are prioritizing ease of up-fit and customization options, proven powertrain options, and strong dealer networks. One of the most frustrating up-fit items with commercial vans is the air compressor. An electric drive air compressor that takes up too much valuable cargo space, is underpowered, and plainly just not suited for commercial work. A gas drive reciprocating air compressor which takes up even more space, is heavy and is known to cause heat damage in the interior of vans. Further, these types of compressors cause safety issues due to exhaust fumes not being properly ventilated, and gas tanks being filled inside the cargo area. Recently a new type of under the hood air compressor has been designed for these vans. 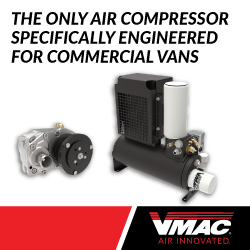 Custom engineered for each engine and van by VMAC, these incredibly compact air compressors are easy to install and have the power to fill a 11R24.5 commercial truck tire in just over 3.5 minutes. The biggest challenge facing all fleet managers is the cost of fuel. Even though fuel prices have crept down, there is an ever-increasing focus on fuel economy from fleet managers. The Environmental Protection Agency says that for every 100 pounds taken out of your vehicle, the fuel economy is increased by 1% – 2%. Based on an average gallon of gasoline at $3.14 per gallon in the USA or $1.45 per liter in Canada (August – November 2018), every hundred pounds saved equates to savings of 3-6 cents per gallon in the USA or 1-3 cents per liter in Canada. Now, to save weight, fuel, and lower total cost of ownership, customers are choosing the vehicle that meets their application needs, rather than going with more vehicle than they really need. This has led to Ford recording their best month on record for Transit van sales in August 2018, an increase of 74%. With new more productive equipment, like underhood air compressors, these vans will continue to carve out their place in the work truck market. Maximizing the return on investment (ROI) of your air compressor and reducing the total cost of ownership of your new commercial van means spec’ing the right compressor for your needs. This will allow you to maximize productivity and increase the number of jobs you can do in a day.